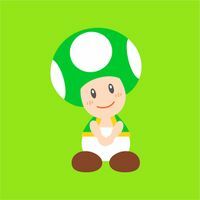 Kinopio-kun is a Toad with a green-colored mushroom cap and a green vest. He is the mascot of Nintendo's LINE social media account. The application is designed for users to text one another, but Nintendo has designed Kinopio-kun as a bot that will automatically respond to users, with prewritten messages. For example, if users text him the name of certain Nintendo characters, Kinopio-kun will respond with his opinions on said character. He makes it clear that he is not Toad himself, but rather a friend of him. His name derives from the Japanese name for Toad ("Kinopio") and the "-kun" part being a suffix used in Japan, usually to denote a man younger or the same age as the speaker. According to the calendar wallpaper images as well as material related to Nintendo LINE, he's friends with a Boo and a few Little Birds. For this subject's image gallery, see Gallery:Kinopio-kun. ↑ Kotaku (October 1, 2015). Nintendo's New Text Bot is Kooky. Kotaku. Retrieved July 7, 2017. This page was last edited on November 11, 2018, at 22:02.